My friend M is expecting her first baby. 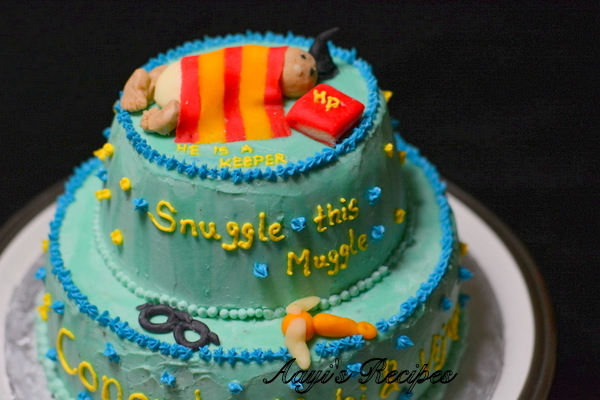 She is a huge fan of Harry Potter. She always talked so passionately about Harry Potter and how she would read the book to her baby whenever she had a baby. 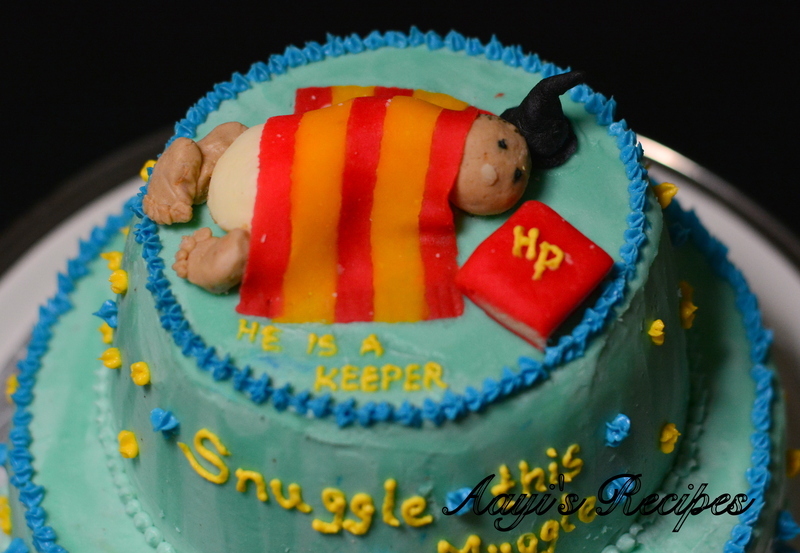 Much before she even got pregnant, I wanted to bake and decorate a Harry Potter cake for her. Last month, I got together with some of our common friends and decided to have a baby shower for her. I immediately knew what I was going to make for her. 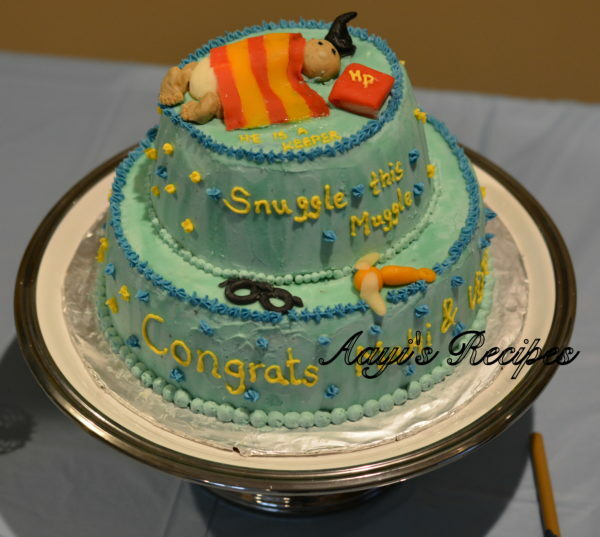 A Harry Potter baby shower cake. We decided to keep it simple and asked everyone to get something that she really loves. We had pani puri, kachori-chole chaat, pakodi kadi-rice, paneer subzi-naan. Every dish was so good. I knew I would not have much time to make too many things. My weekdays have become a little overwhelming with work, kids classes, cooking and other hundred things. I was a bit stressed out that I would probably not have enough time to finish the cake. I am so glad it all worked out. M loves chocolate cake, so I baked this chocolate cake. The icing was my salted buttercream. I wanted to make all the toppers with white chocolate as I did for this cake. I made the baby with white modeling chocolate, but after that, I just could not get it into required consistency. I totally panicked as I had very less time and I did not want to keep trying it. So I got marzipan (made of almond paste) from store and made rest of the toppers. M loved the cake so much. All the hard work was paid off when I saw her totally loving the cake. Although I got stressed during the whole process, every one of my cakes make me realize how much I love working on them. I am already looking forward to my next one!. What a sweet friend you are, Shilpa! Such a special gift for a mom to be. This is truly a “labor” of love (ha ha)- and you did it with such a busy schedule.